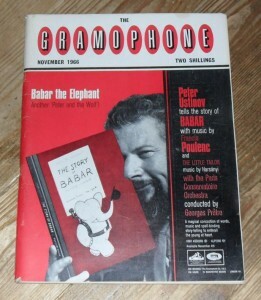 November 1966 of the British Magazine, The Gramophone. Each issue has a variety of features on Hi Fi, recording equipment, music and records . The cover feature of this issue is Babar the Elephant featuring Peter Ustinov. The magazine is in very good condition, with very little marking and wear to the corners (see photo).